So… 2800 miles and 10 days later we make in to the San Juan Islands. It was a great trip and nice to spend that much time with Trey. We saw incredible places and hopefully I got some good pictures. Hard to believe we can do that much in 10 days: Camp in a Loves Parking lot, Mesa Verde, Durango Silverton Train, Learn about camping in National Forests, “stealth camp” in a Teton Village, 3 nights in Grand Tetons, camp in a Snake River Canyon, a Washington state park, see a Ranger game, and on to the Islands. It was a lot nicer than last year where we did the whole trip in 4 days… We also got to know more of the capabilities of the truck and camper. It can pretty much do what ever I want it to do. We went over 11000 feet, up and down no problems (with sometimes over 10% grade), we went off road a couple times. And at the trucks checkup, it passed with flying colors. There was not even hardly any brake wear and the trucks in great shape. Not much today, first day on the islands has to be on island time… which moves really slow. We got some groceries and picked up some fresh crab for dinner. Trey met with Sea Quest to find out his schedule and to get ready for his first trip out tomorrow. 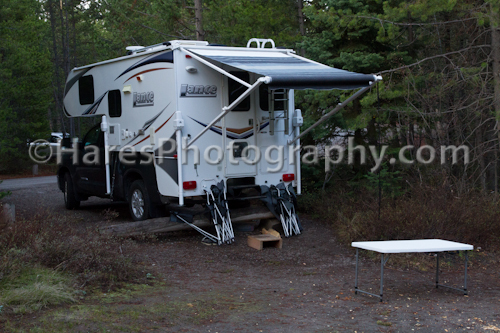 We also found a place to park the camper for the summer so we can use the truck. Nice day and we finished the day with crab, artichoke, and roasted potatoes for dinner. I head back to Coppell on Sunday for McKenna's graduation, so it may be a while before I post again. Thanks for reading along for the first part of the trip! We broke camp and headed towards the Seattle. Going over the mountains we hit SNOW, in May, we were only at about 3000 feet. It mainly just hit the windshield and did not slow us down much. We arrived in Seattle and the Toyota dealership was in downtown with very little space to park. They took one look at the camper and asked if we could take it off the truck for service. We had a hard time finding a place where we could take it off and finally parked right next to the office. It was not level at all. We finally got the camper off the truck and they took us over to the Seattle Mariner/ Texas Ranger baseball game. 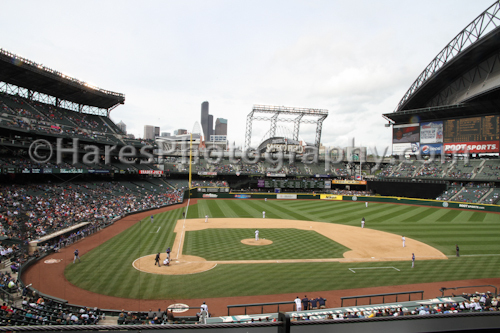 The Safeco ballpark is really nice, It was built in 1999 and has a retractable roof (a must for Seattle with all the rain). The forecast was for 80% rain all day. When we got there, the roof was closed. We were a couple hours early so we walked around the stadium a bit. We went back to get food before sitting down (the tickets included an $8 food voucher which will basically get you a hot dog, or for .50 more a beer…) When we went to our seats, the roof was open. Our seats were incredible and were $55 each (I got the tickets on Stubhub). We had row 1 of section 226. These seats are on the first deck level right next to the pressbox and were part of the Diamond club level. 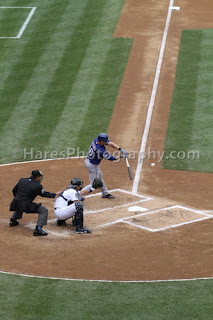 We were looking right down the 3rd base line from home plate. 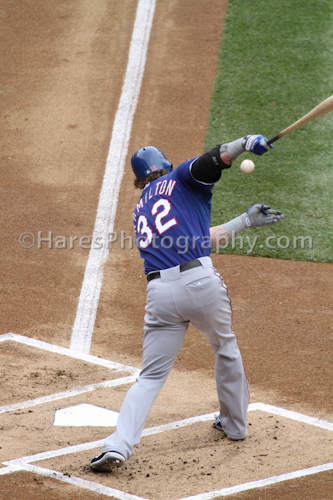 I got very good pictures of the Rangers as they were batting and hope to post pics soon. Liddi from the Mariners got a grand slam home run, so that was the real difference in the game. 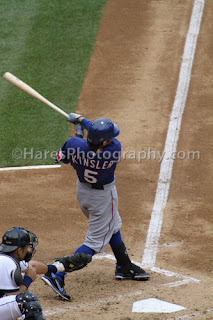 The final was 5-3 with the Rangers loosing. Even though they lost, it was a great day at the ballpark, and we got to see the Rangers play in Seattle. The game was over at about 3:30 so we called for Toyota to pick us up at the game. We got back to the dealership and they had not even started on the truck. We were really hoping to catch the ferry and hoped it was done. Finally we got out of there about 6:30 (it took us a while to get the camper back on the truck because of the hilly parking lot… ) so we were on our way to catch the ferry. I did not get very good gas mileage as we rushed for the 8:25 ferry (after we got out of Seattle rush hour traffic ) We didn’t think we would make the ferry, but we pulled in at 8:23 with 2 minutes to go and they let us on. We were the last vehicle to board! So we made it to the San Juan Islands a day ahead of time. Trey starts work on Friday. A beautiful sunrise this morning in the Snake River Canyon. We got up this morning ready to make the 900 mile trek towards Seattle. Today we cover the rest of Idaho, a little bit of western Oregon, and on into Washington State. The original plan was to go to see and camp at Mount Rainier for the night, but luckily I did some digging on my Droid (while Trey was driving) and found out that most of the roads were still closed due to snow and that NONE of the campgrounds were open (they opened this coming Memorial Day weekend). So… we needed to stay somewhere else for the night. I found a Washington State park called Lake Easton about 70 miles from Seattle and that was our goal for the day. It was a long day of driving and there really was not much to look at in western Idaho, Oregon, nor eastern Washington, but we had a good day. We made it to Lake Easton for the night. Tomorrow on to Seattle to see the Ranger game, get the truck serviced, and then maybe on to the islands? Today we got up early for sunrise pictures. Or I guess I should say I got up... Trey slept till about 10:30 even through multiple shooting locations. 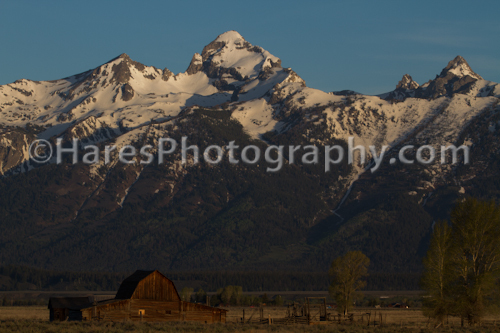 My first stop was a barn on Antelope Flats road with the whole Tetons range behind it. They say this is the most photographed barn in the world. Then I headed to the Snake River Overlook. 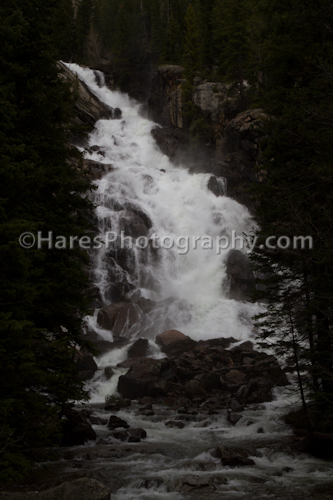 This is where Ansel Adams took his famous picture. Then on towards Dubois to the Buffalo Valley Road, one of the photographers told me there was an Osprey nest about even with the road. I stopped and watched and photographed them for a couple of hours. At one point there were 3 Osprey in the one nest. 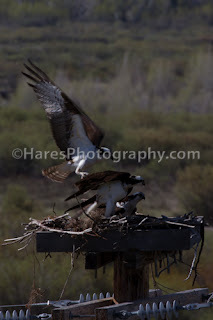 While I was there, a man stopped by to photograph the osprey also. We had a nice talk while enjoying the beautiful scenery and the birds. He was a fire chief for Disney for many years. We talked about Disney and Levi's and it was really interesting how similar the company's had changed between when they were family run and when others came in as CEO and changed the "feel" of the company. From there we drove back to Jackson, enjoying the magnificent Tetons for the last time, and started our trek towards Seattle. We decided to take the non-freeway route through Idaho and it was a good choice. 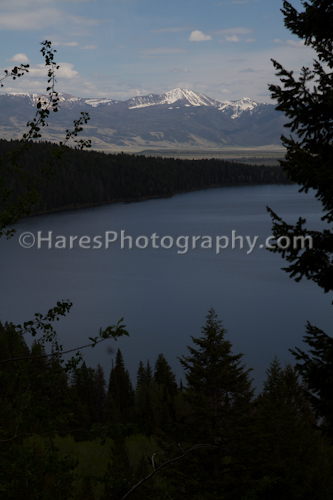 We took Hwy 20 across and decided to stop at the Rapture Conservation area, about 400 miles from the Tetons. On the way we passed the Craters of the Moon Nat Mon. And that was really strange. It really did look like the moon. Barely any life and lava rock chunks and pillars for miles. We finally arrived at the Snake River Birds of Prey National Conservation Area (that's a mouthful) and all that was there was a nature trail in the middle of the Idaho desert. No visitor center, or campground or anything... luckily we decided to walk the trail and there was an overlook to the Snake River and the canyon below. We saw some different raptors, and decided the canyon, hundreds of feet below, would make a great campsite for the night, and it was. Great thing about the truck camper is we can camp anywhere. 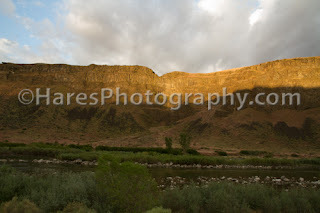 No camping fees tonight and beautiful scenery right next to the Snake River. Tomorrow, on towards Seattle. Trey was still out in the back country camping at BearPaw lake. So I decided to get up early and get some sunrise pictures. 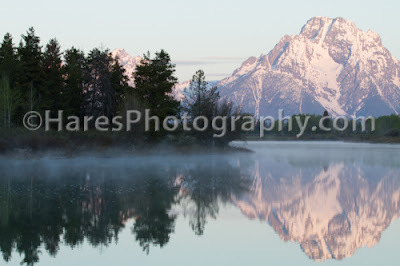 I left camp a little after 5 am and headed to Oxbow Bend Turnout for some sunrise reflection pictures. It was cold, but worth getting up. Everything kept saying that the Tetons were a sunrise park for pictures and they were right. From there I saw a herd of elk and took pictures of them for a while. As I headed back to camp, I saw a fox cross the road, but could not get a picture of it. I met Trey at noon. He had hiked 14 miles the day before to his campsite on Bearpaw lake. He had a great night, but it was cold. He didn't see any bears, which were reported at his campsite the night before. We decided to hike towards Death Canyon trail up to the overlook of Phelps lake (at the southern end of the park). The road there was really bumpy and "recommended" 4 wheel drive, but the Tundra and camper did fine. On the way up to the overlook we met a very wide eyed Australian couple, they were telling us that as they were hiking up the switchbacks, a bear kept cutting the trail to get in front of them! They said that a one point the bear was 5 meters in front of them! They thought the bear was a teenager and just curious ... and asked if we saw a picture if we could tell what type it was.... it was definitely a Grizzly! 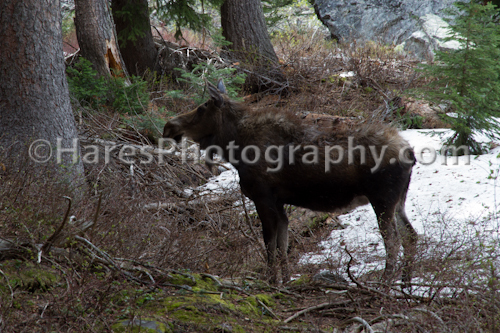 They didn’t have any bear spray and kept just making lots of noise and they were lucky the bear did not bother them. …. So … Trey and I kept hiking towards the bear…. So... Trey and I continued to hike very cautiously toward the bears... We now know there are at least 3 grizzlies ahead… I know... Kim would say... WHY? But we kind of wanted to see one. After a while we met another set of couple of hikers, but one guy had a torn up hat and had one hiking boot and one climbing shoe on? We asked if they ran into the grizzlies? He said no, they were climbers and as they were climbing they looked down and a marmot had grabbed his hat and munched on it for a while…dropped the hat…and then took off with his hiking boot. By the time they climbed down, there was no sign of the boot. We went to set up camp at Gros Ventre campground for the night and had margaritas and then some pasta for dinner. 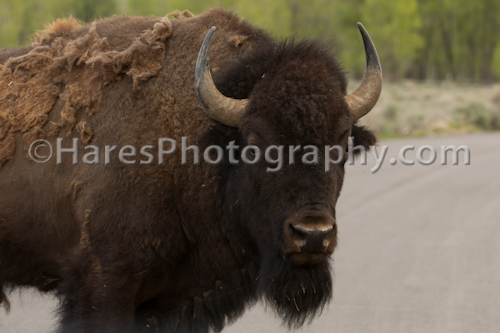 On the way into the campground a bison stopped to pose for us, he even changed positions for pictures. When we were done, Trey said “We’re done, you can move”, and off he went. Nice of him to pose for us. 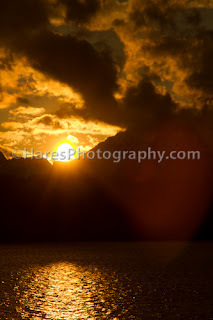 We will be up early tomorrow to get more sunrise pics. We woke up in the morning and had some breakfast. Then decided where we were going to hike for the day. Trey could not wait to try out his new backpack and gear for an overnight. We went to the ranger station and got Trey his back country camping permits. He decided to do 2 separate overnight trips. We left for the hike from the String Lake Trailhead, hiked around Jenny lake and up to Hidden falls and then up to Inspiration Point. The trails were really good to this point, and the falls were amazing. We decided to go up from Inspiration Point and take the back country trail back down to Jenny Lake. There were marmots and chipmunks everywhere. The chipmunks were not afraid of anyone, While were sitting at one of the lookout points, two chipmunks came around to see what we had, they even kept running under my boots, no fear at all. 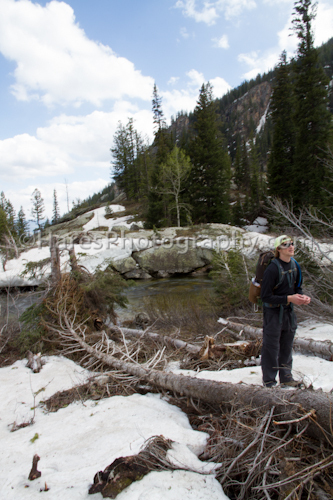 We came across and snow avalanche area that wiped out every tree and everything else in its path. The devastation was hard to believe. We found a ribbon on the avalanche marking the trail and headed that way sliding down the snow. Well that was the last we ever saw of any trail. By that time it was too late to go back up the snow so, with Trey’s Trusty GPS trail tracker (on the Iphone) we knew we could make it back down to the trail and lake. We followed some streams and some game trails. Part way down, Trey goes “look” and we had just walked by two moose. 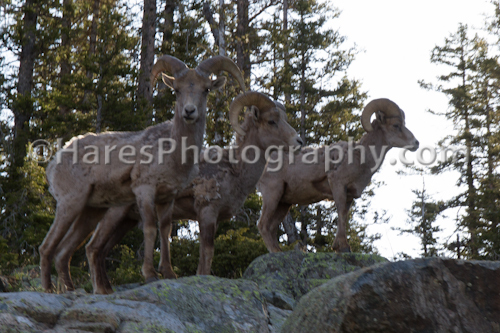 They were just standing there looking at us about 100 feet away. This kind of freaked out Trey, because we didn’t even know the moose was there, it could just as easily been a bear…. So he put the bear spray on his chest and we headed on down till we hit the trail. We finished the trail, and just before the parking lot Trey went off for his overnight adventure. We had hiked 7.7 miles (per Trey’s tracker) and Trey still had 4.8 miles left to go up to his campsite at Bearpaw Lake. He let me know that he arrived safely about 7:30. I will meet him tomorrow at noon (or when he calls). I went and took some different pictures around the Tetons, and headed back to the campground at Signal Mountain for the night. Stealth camping for the first time worked great. No one even knew we slept in the camper….We got up and went to have breakfast in Teton Village and we went to a little café for a very nice breakfast. Then we headed on into Grand Teton National Park. On the way we saw a lot of birds, a moose, and some elk. No bears yet… we stopped by the visitor center to find out about backcountry backpacking for Trey and to find out about which campgrounds were open. We found out that Trey’s backpacking can not go very high into the mountains because at about 100 feet higher, there was still a lot of snow. The Ranger asked if Trey had an Ice Ax… which he didn’t. The weather was on and off Raining, so we decided to get a campsite for a couple of nights at Signal Mountain Campground. We found a nice campsite (#44) not far from Jackson lake with some pretty good views of the Tetons (whenever they decide to poke out through the clouds). We setup camp, There are no water or electric connections, and even though there are bathrooms there are no showers around… So we dumped the tanks on the camper and filled up with fresh water, and decided to take a shower for the first time in the camper. I am not sure why I put that off for so long it was really much better than I expected. The hot water was really hot, and because the shower space is so small, it turns into a steam shower really quickly. Trey and I both took too long of showers but it was really nice and relaxing. We used about half of the freshwater tank… but no big deal, the dumps station for the grey water is not far away and we can always get more fresh water there. I did some processing on all the pictures and hope to get some uploaded to the website soon. We had a great Ribeye Steak dinner on the grill and had macaroni and cheese and corn, and of course a couple good beers. We then went over to watch the sunset on the Tetons over lake Jackson, it was a great way to finish the day. 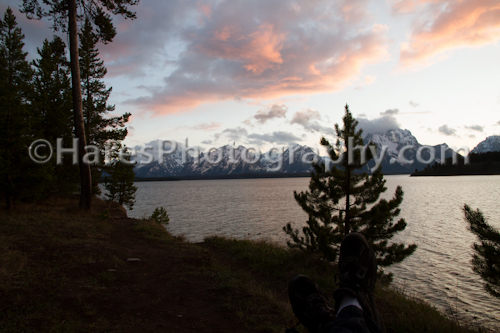 I got on the road about 7 am for the long drive to the Grand Tetons. I say I, because Trey was still sleeping in the camper…. 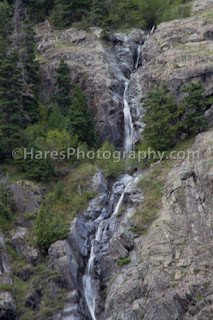 We decided to take the scenic/mountainous route 550 starting by going over the pass to Silverton. We reached about 11,000 feet at one point. 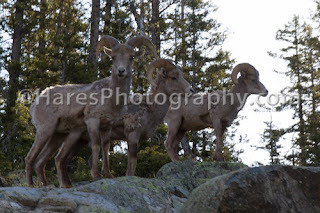 Along the way we saw some big horn sheep in the road and off to the side. The views at the top of the pass were amazing. One of the pulloffs said to “take a deep breath, you may never breath this pure and clean air anywhere else”. I tried some panoramic pictures, taking the full 360 degrees from the point at Molas Pass. We will see how those come out. We continued a lot of up and down and many back and forth curves. It took a while but it was worth it. We only covered about 100 miles in the first 3 hours. As we were coming out of the mountains, the speed limit increased so we hoped to start making some good time, but ended up behind an old truck hauling cattle, that was only going 35 mph. The line was way backed up with no way to pass. After over a half an hour, we saw a place called Ray’s Jerkey, a local guy that produces all kinds of Jerkey. We tried Buffalo, Elk, Hickory Smoked, etc. and bought some Elk Jerkey and some licorice and blue raspberry ropes. By the time we got back on the road, the slow person was gone and we finally got to make some pretty decent time. We got up a little after 6 and went and had a good hot shower before heading to the train. It took us almost an hour to get to Durango and get parked for the train ride that left at 8:30 am. I had booked the tickets on Sunday and decided to go “Presidential” class on the way up, and we took a different car and went first class on the way back. The Presidential car was the Cinco Alamas. And the Car on the way back was the Parlor car. The Presidential car was built in 1888 and many Presidents actually rode in this car. It was the last car on the train so we could see out the back and down the tracks. The Car had a back deck with a couple of chairs and the foot stool and could fit about 5 people. It was like a small balcony on the back of the train. … Very nice. Dot was our server/guide and she did a wonderful job letting me know when the best pictures were coming up. I took way too many pictures, but it was a lot of fun. The car was great because we had lots of room and only about 20 people in it ( compared to 40 or 50 in the other cars). Our small section had only 8 wonderful people to spend the train ride with. They were a lot of fun. We also got to move around a lot… front lookout, back porch, out the windows etc….. Well worth the upgrade price. After lunch we walked around a bit and then caught the 2:30 train back. 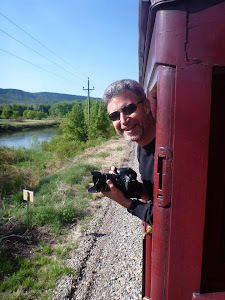 The Parlor car was nice, but not as nice as the Presidental car. The back deck you could not sit on, and would only hold about 3 people. We were at the back of the car so we could see out the back of the train from our seats. Still a wonderful way to ride being able to look out the back of the train. We arrived back in Durango, tired, but lots of fun and needed to find a campsite close. We found campsite in the National Forest called Junction Creek. It was a great campsite. National Forests are the way to camp, and not many neighbors this time of year. Our site was D1. I had good 3g coverage and tried out my mobile hotspot on the Droid 4. It was pretty amazing to sit there in the middle of a National Forest and have internet connectivity! 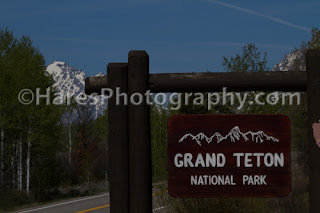 Tomorrow it will be up early to make the trip to the Grand Tetons, up through Silverton and over to Wyoming. Over 600 miles. We will see how far we get. I woke up about 6 and started reading my journal of my trip from 1986 after I finished college. My first stop was Albuquerque. 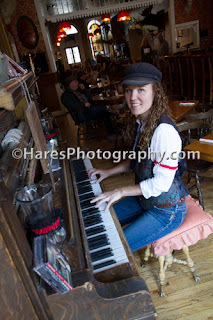 And then on to Durango.... I also started the journal for this trip. We changed time zones. It was a great night of sleep for the first night in the camper. And for being at a truck stop... Trey was still tired so I decided to get going with him still sleeping in the back about 7:00. We travelled about 475 miles today. At least the scenery was better than the day before. We went through Albuquerque and saw the Sandia’s but did not really stop except at REI to pick up a few things. We tried the WiFi in the parking lot and was able to purchase the Seattle/Ranger tickets through StubHub. (more details on the seats when we go to the game on the 23rd... stay tuned) the WiFi would not download my email so along the way, as Trey was driving, I signed up for Verizon's Mobil hot spot. Didn't really get to use it today though because we were in and out of coverage. We were making good time and decided to go on to Mesa Verde. We got there about 4:30 and drove to find our campsite. By the time we registered and found the campsite it was too late to take the Cliff House or Balcony Tours. The last tour for both was at 5:00. 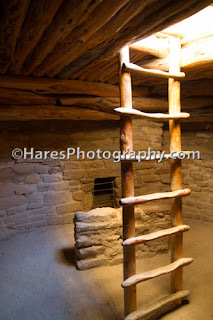 We met a lady in the park that had taken the Balcony Tour and said it was really great because you get to “feel” how the Indians descended into the cliff dwellings. (one ladder was over 32 feet). We instead made it to Spruce Tree house to hike down and see the dwellings there. That one was open to 6:30 and was about 45 min round trip. 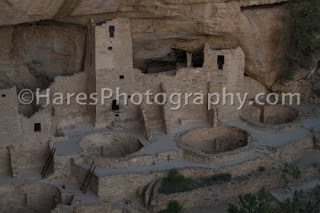 After that we did the Mesa Loop where we were able to see 9 different dwellings from the road including Cliff House. We also saw some of the Pit houses (what they lived at on top of the mesas). We drove around till about sunset looking and taking pictures and then headed back to camp. It was a nice night without the moon. The stars were really bright. We cooked Boar’s Head Brats on the fire and had some Chimay’s. Great way to end day 2. 475 miles today, averaged about 13.5 miles per gallon. 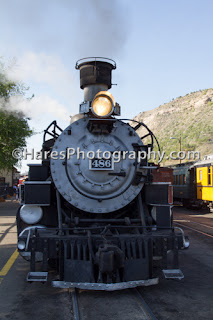 We needed to get some sleep trip for the Durango Silverton Railway tomorrow. The day finally arrived to start the trip. My great adventure. And I am fortunate enough to be able to take the trip with my son Trey. The trip has been months / years in preparation. It is strange for me to not have every leg of the trip planned out. We did not even decide where to go until the night before we left. 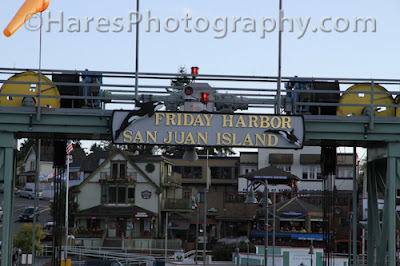 All we knew was that we were leaving on the 14th and had to be on San Juan Island, WA on the 24th. We knew we wanted to spend time in the Grand Tetons for Trey to backpack and for me to take pictures... for the first stop we decided to go to Durango to catch the train. Late the night before. I made reservations for the Presidential car on the way up and for first class on the way back. I really like the attitude of having the freedom to take life as it comes. What wonderful start to just think about the train and have that be our first stop. Today we were talking about baseball and thought wouldn't it be nice to catch a game in Seattle on the way up on the 23rd.... so we started looking and you would not believe who Seattle is playing that day.... the RANGERS... so we have to get tickets!